Stirling has always celebrated the work of Robert Burns, from the time of his visit in 1787 when he stayed at Wingate’s Inn (now the Golden Lion Hotel). For many years, 27 August, the day Burns dined with Dr David Doig of Stirling Grammar School and Lieutenant Forrester of the Castle Garrison, was held as Burns Night in Stirling. On 25 January 1859, all of the shops in Stirling closed for the national centenary celebration of the poet’s birth. There were other national celebrations for the 250th anniversary in 2009, which were universal but perhaps unacknowledged as being generated in Stirling. 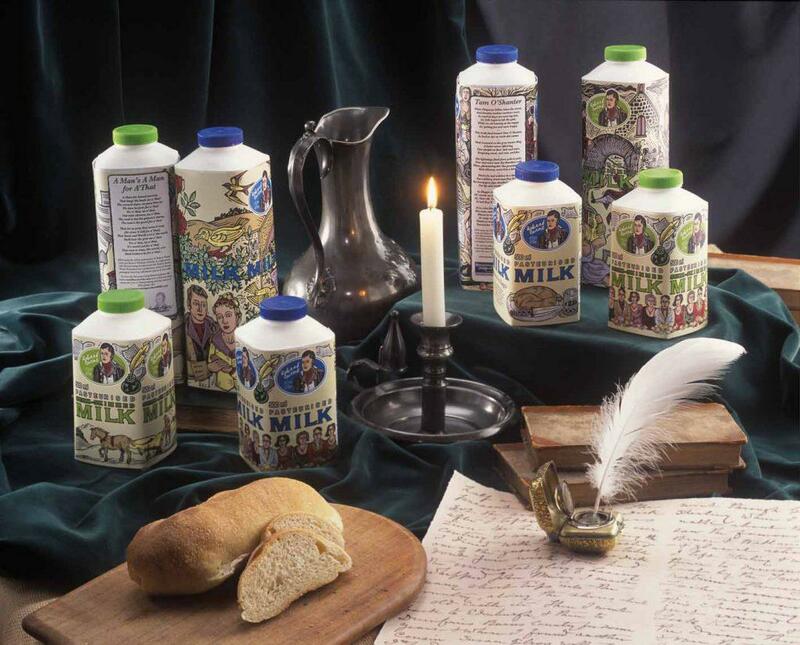 Robert Wiseman Dairies issued special packaging for their milk in January, and the artist chosen was Stirling’s Owain Kirby who illustrated the poems Tam O’Shanter and A Man’s a Man for a’ That. The design of the packaging was by Hamilton Design, who like Owain Kirby have had a long association with the Stirling Smith Art Gallery and Museum. Burns was pivotal to Stirling’s history. His Stirling Lines, which can be seen in the Smith and on the pavement outside, summarise a very bleak era in the history of the burgh, and every Daughter and Son of the Rock should know them.